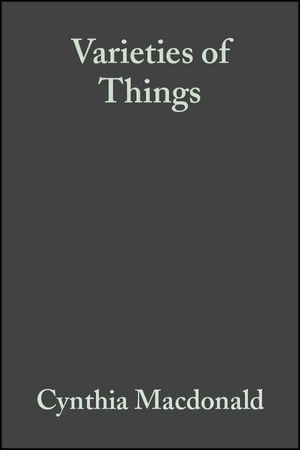 Varieties of Things: Foundations of Contemporary Metaphysics is about some of the most fundamental kinds of things that there are; the things that we encounter in everyday experience. A book about the things that we encounter in everyday experience. Contains a thorough and accessible discussion of the nature and aims of metaphysics. Examines a wide range of ontological categories, including both particulars and universals. Mounts a forceful and persuasive case for anti-reductionism. Cynthia Macdonald is Professor of Philosophy at the University of Canterbury, New Zealand. She is Associate Editor of the Australasian Journal of Philosophy and the author or editor of numerous publications, including The Philosophy of Psychology: Debates on Psychological Explanation (co-edited with Graham Macdonald, Blackwell, 1994), Connectionism: Debates on Psychological Explanation (co-edited with Graham Macdonald, Blackwell, 1995) and Contemporary Readings in the Foundations of Metaphysics (co-edited with Stephen Laurence, Blackwell, 1998). "Macdonald’s Varieties of Things: Foundations of Contemporary Metaphysics is an excellent study in ontology. It provides a descriptive metaphysical account of the ontology of material substances, persons, events, and universals. While the book provides a sophisticated account of the issues, it is written in a way that makes it accessible to an advanced undergraduate student audience. And given its novel defenses of some positions, it will also be of considerable interest to professional philosophers working on the issues"
"Amongst the book’s most notable virtues are its clarity and the author’s careful attention to detail in setting out arguments and counter-arguments for various positions. The opening chapters on the nature of metaphysics are excellent. The later chapters on material substances, persons, events, and universals are thorough, closely argued and well informed."